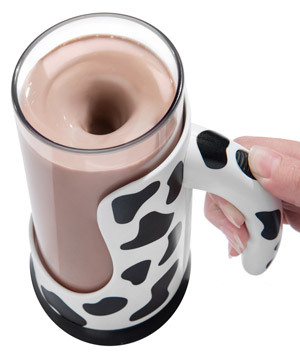 Mix up some fun (and chocolate milk) with the Moo Mixer Supreme! 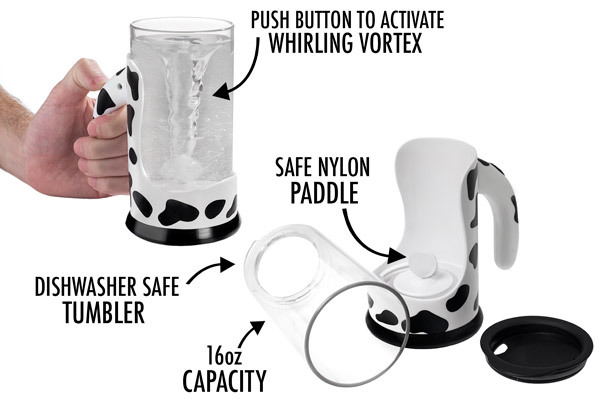 This battery-operated cup with a cow-themed handle stirs your favorite flavor into single servings of milk with a powerful whirling vortex. 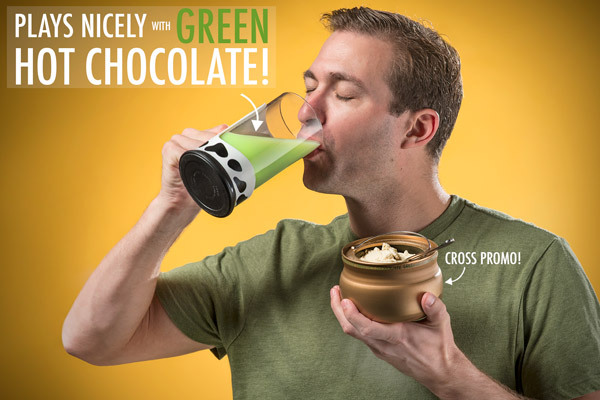 Just pour in milk, add your favorite flavored syrup or powder, and press the button on the handle to activate the cyclonic stirring paddle integrated in the cup. Then enjoy your tasty beverage from the same cup! Spoons are so last decade. Mix up your milk with the Moo Mixer Supreme, a sweet mug with an integrated battery-powered mixer. After pouring in your milk and your choice of flavoring, just press and hold the button on the handle to enjoy a perfectly mixed milk. The mixer's motor is powerful enough to create a vortex in the cup that can easily blend syrups or powdered flavoring. For those looking to bulk up, the Moo Mixer Supreme also makes a perfect protein shake maker. The Moo Mixer Supreme is an all-in-one solution for enjoying a cold glass of milk just the way you like it. When your 16-ounce beverage is adequately mixed, the Moo Mixer Supreme makes the perfect travel vessel with it’s integrated handle and spill-resistant top. Adorned in dairy cow spots, the mixer is easy to clean up. The dishwasher-safe tumbler quickly detaches from the handle and the finger-safe nylon paddle is simple to clean by hand. It does a body better than good! Think of your beverage as a blank palette. The Moo Mixer Supreme is your brush, and what you add to the drink is your paint. Mix in Kool-Aid, strawberry syrup, protein powder, malt mix, green hot chocolate, or make your own concoction by mixing several together. 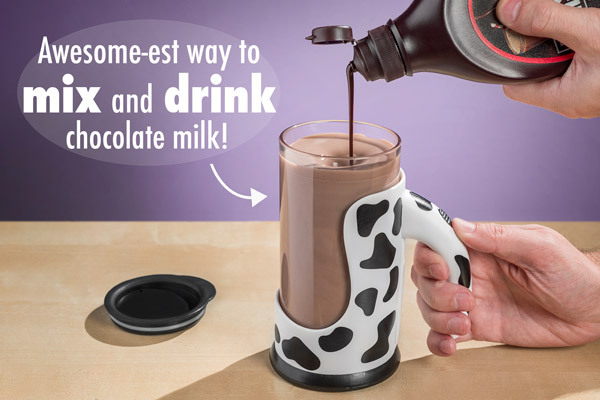 Question: How long does it take to stir up a delicious glass of chocolate milk? Answer: To get a nice even mix, add milk first and then your syrup or powder. Hold down the button for about 30 seconds. Question: Can I put something other than milk in it? Answer: Of course! Stir in the cream and sugar for your coffee or mix some Kool-Aid with water.